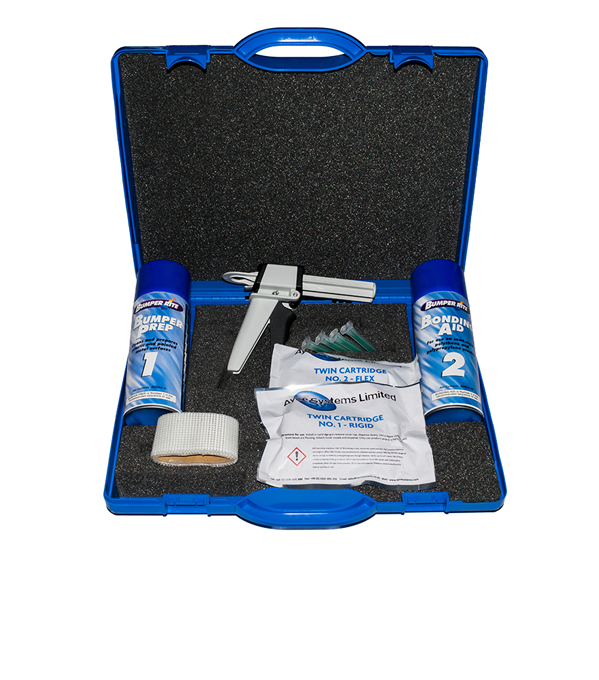 The Bumperrite Repair System is designed for the repair of textured plastic bumpers, wing mirrors and trim. The perfect bumper repair equipment. Cracks or holes can be repaired and filled using the cold plastic welding kit, and following the simple steps, the scuffed, scratched or damaged area can be easily repaired, re-textured and repainted to the highest quality standard. With all the materials used in the Bumperrite system designed to be flexible, they will not crack or flake off as conventional paints will. Available in Coarse, Fine and Clear textured finishes and with the Bumperrite Top Coat available in most required colours, matching up to any bumper or trim is now a quick and easy process. For more information about our Bumper Repair System click the button below to download the print friendly PDF brochure, or if you would like to receive a quote for this system, please click the request a quote button.